A million dollar view! The best three bedroom panorama at Red Pine and one of the best in the Park City Area. Newly remodeled with rustic mountain decor. Direct condo check in. Free wireless internet and three televisions. You will experience staying in a true mountain retreat and you will not find a more enjoyable three bedroom condo at any price. For those that need two or more places we can help. We have one other unit in the same building. In addition, for a small fee we can get you started with food and beverage so you can avoid going to the store on day one. We take pride in making our condo special and memorable for our guests to enjoy. We have decorated with unique art work, knotty alder, and unusual and interesting mountain furniture. After skiing you can relax in front of a gas fireplace while looking out at the view. This chalet is at the upper end of Red Pine. As can be seen, this condominium has beautiful views of the mountains and The Canyons ski areas from both the living room and the private patio deck. The entrance is private and secluded unlike most other hotel/condo developments. Convenient parking is located next to the building. This chalet has been remodeled with new kitchen appliances, cabinets, tile floors, carpet, furniture, decor, and a washer and dryer. The beds have down comforters to make you warm and cozy at night. This is our vacation home. We are located at the base of The Canyons Ski Resort. You will be five minutes from Park City Mountain Resort, old town Park City, and Deer Valley. Busses to all Park City ski areas are located at the entrance to Red Pine. World famous Snowbird and Alta are only 40 minutes away. 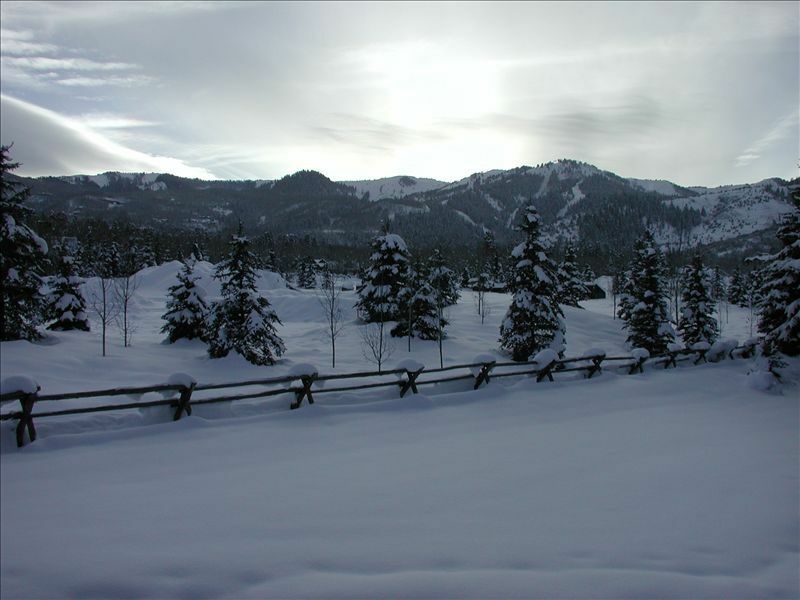 In fact, Red Pine is the perfect location from which to ski all of Utah's Wasatch Front ski areas. 'The Canyons' has grown from the locals' favorite for powder and terrain to a first class international destination resort. With 3625 acres of terrain served by one of the world's newest and fastest lift systems, you can still find untracked powder days after a storm and discover secret spots just like in the old days. We believe The Canyons ski resort and its facilities are the best in the Park City Area. The kitchen and pantry are completely stocked with utensils and cookware. Basic foodstuffs are also supplied. To save you time, we can stock food in this unit for a slight fee. All linens are provided including flannel sheets, down comforters, and nice towels. A gas fireplace heats the unit. There is also electric heating if needed. A gas BBQ and patio rod iron furniture are provided on the deck. The Red Pine complex features a club house and two full-size swimming pools that are surrounded by beautiful mature pine trees. One pool is heated to 100 degrees in the winter. There is a child's pool, indoor and outdoor hot tubs, and sauna. There are also tennis and sand volley ball courts only a minute away. All or our guests rave about the club house and its facilities. There are more trees in the Red Pine development than in any other codominimum complex in the Park City area. As such, you will truly have a mountain experience. We are family-friendly, but cannot allow pets. These are non-smoking units; this is strictly enforced. One can, however, smoke on the patio deck using the ashtrays provided. This is your spot for year-round activities at prices that make these codos the best values in the Park City area. Plan on saving 50% from resort prices. Utah and the Park City area has the best golfing in the country for the price. All our summer visitors come to play golf at our seven local mountain golf clubs. A total of 58 golf courses are within an hours drive from Park City. Come stay with us. We have never had any 'unhappy campers.' Many of our quests return each winter and summer. Anne and I purchased this property in 2000. We have remodeled and continue to add things for our guests to enjoy. The latest set of pictures shows the knotty alder wood doors and trim. We love Park City and this is our second home. We actually take advantages of all of the outdoor activities present such as golf, fishing, horse back riding, water skiing, and motorcycling. While we grew up in California, we will never leave Park City or Salt Lake. Imagine, coming here will take you back thirty years. We chose this property for the view and the location. Staying at Red Pine puts you inside the Canyons Resort. Guests are actually staying at a ski resort. In addition, Red Pine also offers a great recreation facility with two pools, kiddie pool, two hot tubs, and a sauna. Everything is so close. There are three resorts just in the Park City area. Snowbird, Alta, Brighton, Solitude, and Snow Basin are all less than an hour's drive. Park City itself is one of the greatest destination resorts in the country. Park City has its own unique culture to enjoy. A great panorama. You look at the mountains without any distractions. This is the best condo at the best price for a three bedroom at Red Pine. Must come through the front door. 4 new courts for owners and quests only. The golf course at The Canyons will be done in 2014. Other courses three miles away. Gas BBQ and private patio. There is a washer and dryer, new cabinets and tile floors. This Unit has one queen, two full, and two twin beds, The club house has outdoor heated pools, indoor sauna, and indoor and outdoor hot tubs. Seven golf courses, three ski resorts, and ice skating within minutes. Utah and Park City has the best golfing for the money anywhere in the country. There is great shopping in both unique and discount stores the Park City area. The Canyons has many fantastic restaruants, There are motion picture theaters and sport facilities close by.